Greetings from RTU. Work on the JK Meditation Hall is making progress and our staff members are helping to complete the gable roof. 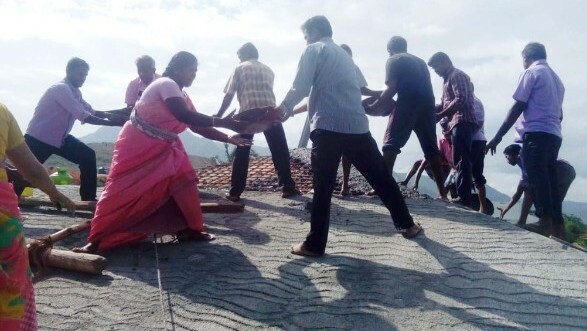 They did voluntary physical labouring on the construction site, carrying stone chips, water, and cement to assist the skilled labourers. Now the builders are busy with plastering the ceiling and walls. In order to add to the pastoral support we provide the children in our care, one of our students is being trained as a counsellor. Meena completed her BSc and BEd course in Jeyaraj Annapackiam College and we are helping her to study a diploma course in Counselling in Anugraha College in Dindigul District for this academic year. 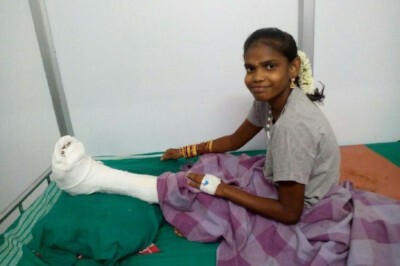 Pushpa, who is 13 years old and was born with a club foot, had further surgery in the Government Hospital in Theni and now she is resting in bed. Mrs Vijaya, her foster mother, is taking care of her very well and we are very thankful to her. Kudos to Ayyanar: One of our students, Ayyanar, who is studying the 2nd year of a Diploma in Mechanical Engineering at Coimbatore Government Polytechnic, received the best student award for his good academic and other co-curricular activities. We congratulate him on his good performance, talents, and being a path-maker. 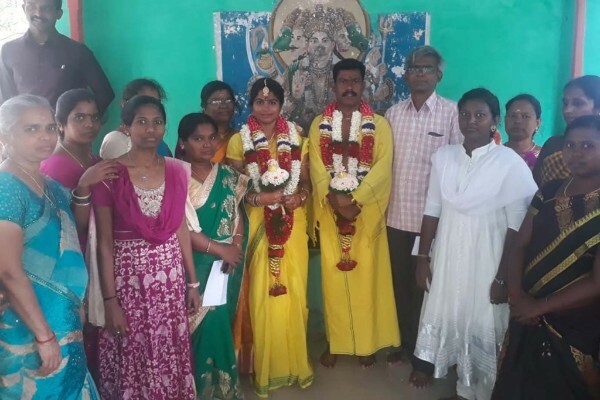 Marriage bells: On 11th July one of our former students, Mohana, married Madukumar in Annaipatti village temple. Mohana came to RTU in 2001 as her had father died of cancer and her mother has mental health problems. Mohana completed her Diploma in Computer Engineering in Kammavar Sangam Polytechnic College in Theni with our support. She also completed her BE Engineering and she now works for a private company in Madurai. On 2nd July Mrs Mariya came from Susaiapperpuram in Madurai District with her three daughters to join us as a foster mother. Her husband died of a heart attack two years ago. Her relatives did not extend any help for his cremation so she had to borrow money from her friend for his funeral. She took care of her children in a small rented hut in a slum area. After her husband died, she found life miserable and she could not get sufficient work to feed her children. They spent many days without food. Fr Louis, the parish priest of Gnanaolipuram, noticed the poor condition of the family and so he referred them to RTU. 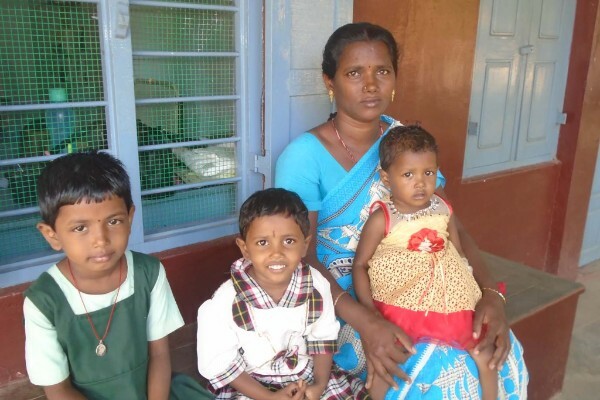 Now Mariya Jeyarani has joined as a foster mother in Sirumalar Children’s Village and three of her daughters stay with her. Praiseworthy prizes: On 20th July, the zonal level inter-school chess competition was organized by the Government at Periyakulam. Six students from our school participated in this competition and received prizes.We appreciate their talents and confidence and wish them all the best in the District competition. 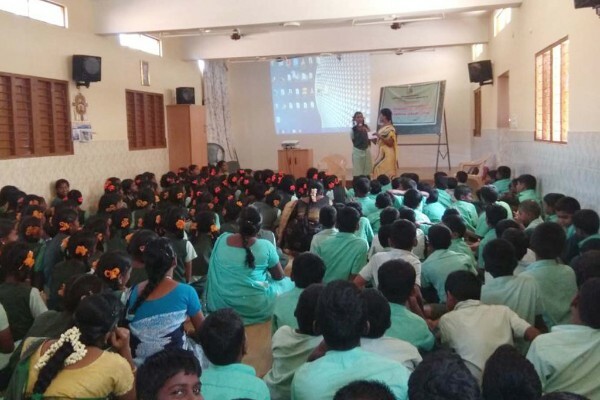 Child rights awareness camp: On 17th July, a special camp on the protection of children was conducted for our 6th to 8th standard students (aged 11-13) by the Theni District Children Protection team. In total, 350 students attended and received awareness on how to protect themselves from sexual abuse and exploitation. They also received knowledge about types of violation that are present in our society which limit their chances of surviving, growing, developing and pursuing their dreams. As part of our aim to empower rural women and give them the means to earn a living, we have three mobile tailoring training units running six accredited courses a year for around 140 women. 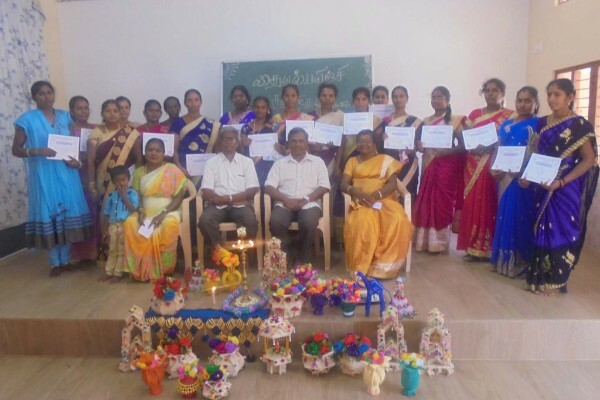 On 30th June, we held a function to honour the 72 women who have recently completed their training to present them with their Tailoring Course certificates. Fr Antony Paulsamy, Mrs Shanmugalatha and Fr. Maria Antony participated in the function and encouraged the tailoring students by their felicitation. On 23rd July, 3 new tailoring centres (1 in Nallakaruppanpatti and 2 in Jeyamangalam) were started to train rural women in our target villages. In total, 113 women are now attending daily and, on completion, they will get an accredited qualification and will be able to earn a living by sewing handkerchiefs, blouses and shirts, chudithars as well as handicrafts. 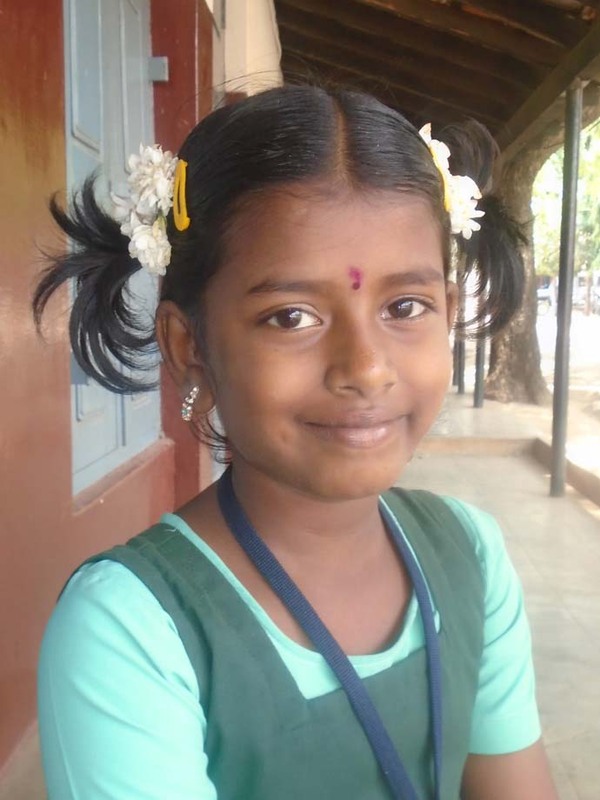 Yuvashri is 9 years old and lives in G Kallupatti village with her mother who is 27 years old. Her father was a driver and he died of a heart attack when she was a year old. After his death, the grandmother cared for them with her small earnings. When her grandmother became old and sick, her mother started working in a spinning mill in Periyakulam. She earns a small amount each day to care for Yuvashri and the grandmother. They lived in a rented house for 2 years. With her small earnings, her mother found it difficult to pay rent for the house as well as buying medicine for the grandmother. Seeing the poor family background, RTU built a safe house for them. Yuvashri started her education with us from her childhood in RTU balwadies (pre-schools) and now she is studying 4th standard in St Peter’s Primary School. She holds first rank in the class and she is a very responsible girl. She wants to study well and become a teacher. Health is wealth! The RK Cardiacare Centre in Dindigul organized a free medical camp in collaboration with RTU’s Pushparani Clinic and RTU alumni in our main campus. Dr V Veeravignesh and Dr Cherli Nancy screened more than 100 people during the health camp. Among those, 56 members had a follow-up ECG test. The objective of the camp was to provide information regarding diet, exercise and weight control. The beneficiaries also received free medicine. Three students from our Home Support programme have got places at Uthamapalayam Teacher Training College and they will continue their training course with the support of our JK Scholarship Fund. We wish them all the best in their studies and complete their courses successfully. With all your generous support, we can feel a unified sense of compassion and concern towards the children in our care. We are proud to continue our service to the poor here. Thank you for helping us to extend our impact. We are sure that together we can make a difference in the lives of our children. I take this opportunity to thank all of you for your unstinted co-operation in all our endeavours. We all remember you in our prayers. Thanks for holding our children into your loving and tender arms.